Hi, my name is Tyson Mazer, and I’ve known Jarrett since grade 3 at Sansbury School; we’re best friends… I built his house in 1999 and the addition in 2012. As a thank-you for volunteering on the mountain, I tribute this theme to celebrate: 25 years as a BC Park Volunteer… I’m proud of you!! 2014 celebrates Jarrett’s 40th birthday; congratulates 22 years of service with Canadian Forces with the awarding of CD1; and marks his 25th anniversary as a volunteer at John Dean Provincial Park. Yes, during spring break 1989 he was 14½ when he first excavated the great stone steps along Bob Boyd’s Climb and participated in building the Slektain Trail. Since then he’s taken care of the park and revealed its history. For his volunteer activities, in 2010 Jarrett received a federal public service Community Contribution Award; and in 2012 he was selected as the BC Parks Volunteer of the Year. Touria and Jarrett have two boys: Amir, 2011; and Sami, 2013. Onwards they go . . . Presented to an individual or couple. Recognizes a special or significant achievement to BC Parks from volunteer efforts. Review criteria: time investment, commitment to BC Parks, impact of efforts. Presented to a group or organization. Recognizes recent efforts, contributed considerably to the preservation and/or appreciation of a protected area (e.g. time, special project). Review criteria: time investment, commitment to BC Parks, and impact of efforts. Recognizes cumulative accomplishments through volunteerism that have made a significant impact on parks and protected areas. Presented to a collaborative partner, partnering agency/jurisdiction or other entity that contributes to BC Parks in other ways than directly volunteering in parks. Recognizes significant collaborative contributions to park programs, services or facilities. Review criteria: project scope, strength of collaboration, leveraged resources, community engagement, and impact of contribution. Thank you to all the nominees for your dedication to BC Parks! We couldn’t do it without you all!! 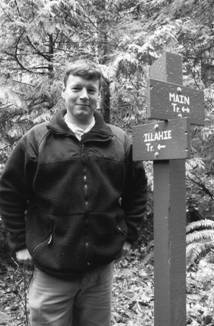 Jarrett has been volunteering at John Dean Provincial Park on Southern Vancouver Island since 1989. Jarrett’s first experience with the park was at the age of 7 on a visit to the park with his father – he’s been hooked ever since. In 1989, age 15 he recognized its potential as the first donated park in the Province of British Columbia, and the home of the last remaining old-growth forest on the Saanich Peninsula. Since that time he has worked tirelessly to preserve its beauty, protect its natural values, and to make it more accessible and enjoyable for visitors. Jarrett’s long service for BC Parks at John Dean can be seen virtually everywhere in the park. From his creation, restoration, and maintenance of the hand carved signage throughout the trail system, to his maintenance of trail water bars and culverts, to the absence of garbage and English ivy. Over the years Jarrett has become a very familiar face to many park visitors. He is recognized by many as a subject matter expert on all things having to do with the history of the park. He is always open to questions from visitors, and on request, has treated people and groups to guided walks through some of the historical gems of this Provincial Park. Jarrett’s passion for the history of this place and its namesake has resulted in him writing and publishing 4 books on the subject and establishing and maintaining a website dedicated to providing current and historical information on the park and John Dean (http://www.johndeanpark.com/). When Jarrett is not volunteering his valuable time at John Dean he is a husband and the proud father of 2 young boys. Jarrett is also an active member of the Canadian Armed Forces, stationed at CFB Esquimalt. I’ve know Jarret for years and I would just like to say the world needs more people like him. The dedication to the parks and the people around him cannot be easily matched. Thanks Jarrett for everything you continue to do.